Hangover Sweats: Can One Sweat Out Alcohol? One of the commonly felt negative symptoms that can result from a heavy night drinking is the hangover sweats. 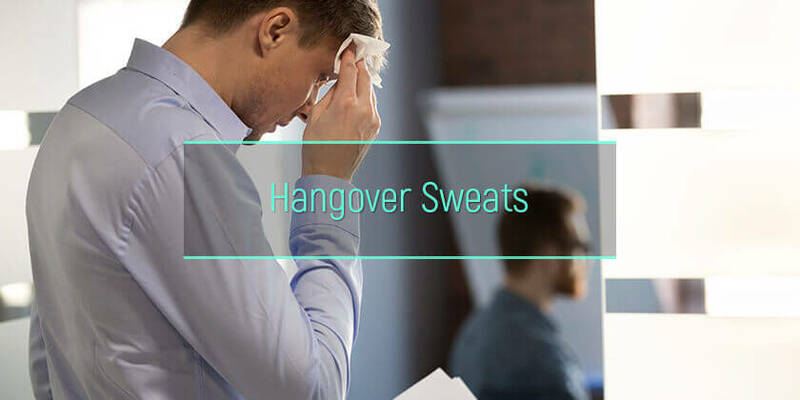 Occurring as part of a list of accompanying symptoms which come together the morning after a heavy amount of drinking, hangover sweat is an unwanted effect that tends to follow high levels of consumption. The following article will look into the various causes, effects and any other interactions between alcohol and sweating. Read on to learn more about the excessive perspiration as one of the warning signs of a hangover. What are the hangover sweats? Why does hangover cause intense perspiration? How to cope with hangover sweats? Is it possible to ‘sweat out’ the hangover? Does the sweat smell change during a hangover? Most people who are familiar with heavy nights drinking will also be familiar with the sensation of secreting liquid from the skin profusely and uncontrollably the morning after. This sensation is just one of many reactions that the human body can have to excessive amounts of drinking, and it is known as the hangover perspiration. Much like hangover chills, this is felt after drinking and can be seen in a person sweating out alcohol the next day. This type of symptom can occur as a result of intolerance or overuse of alcohol, which means that a person may sweat out alcohol whether they have one drink or they have many. It can also happen if a person who is dependent on drink stops drinking. So, alcohol sweats the next day are the part of the real hangover meaning. For any patient trying to find out how to get rid of hangover headache to combat excessive sweating after drinking alcohol, first it is important to know what causes it. Why is it that a person who drinks heavily or another who drinks moderately but has an intolerance find themselves waking up sweating and shaking? There are various known possible causes which tend to differ depending on individual tolerance as well as the amount consumed. Alcohol sweating is a response that the body has to an amount of spirit that it struggles to process. This inability to deal with certain physiological effects that liquor has on the body can alter the processes of the nervous system and how the body can regulate things like temperature or blood pressure. Just like patients report diarrhea after drinking alcohol, many will also report sweating and shaking hands. When a person is dependent on a drink of any kind, the sudden stopping can lead to withdrawal symptoms including alcohol withdrawal cold sweats. One of the main negative effects that the hangover has on the body causing wetness is how it changes the heart rate as well as the blood vessels. Heart rate is increased which leads to blood cells in the skin widening. Alcohol intolerance means that the body finds it incredibly difficult to process any type of spirit and many can experience lower back pain hangover symptoms as well as the perspiration. A body’s inability to tolerate drinking heavy or otherwise can have a massive part to play in causing this type of bodily secretion. If a person is aware that they have this type of intolerance, then they should be aware that drinking can result in the need for information on how to stop alcohol sweats. Intolerance can also cause a need for vomiting after drinking alcohol remedies. Although these symptoms can see people perspire at any time of day, they are most frequently felt at night and after heavy drinking. This is why they are labeled the ‘night sweats.’ This kind of perspiration can last anywhere from just a few hours to several days. Pay attention to the other possible symptoms: for example, the hangover chest pain in combination with the excessive sweating might be a sign of heart disease. There are those that lean towards sweating out a hangover. Some people swear by going to the gym or the sauna to purposefully sweat out a hangover. But is it possible? And more to the point, is it safe? The truth of the matter for those wondering does sweating help sickness, is that this does not work. While a person might experience a slight jolt of energy or motivation, forcing the body to perspire does not have the effect of lessening a hangover. A few other symptoms of a hangover may be affected by the exercise of this type after drinking such as red spots on skin after drinking alcohol due to the steams effect on the skin, but it will not make a person feel better. Because these types of symptoms are brought on by heavy consumption of drink, in the majority of cases, the smell of the liquid leaving the skin does change and tends to smell like liquor. The reason that there is this change in the way a person smells is that this type of secretion contains an acid which has a similar scent to vinegar. From what is known about this type of response from the body, it can be caused by heavy drinking. However, it can also be caused by intolerance and made worse by various factors such as lack of hydration or incorrect diet. The best means of easing the symptoms is to eat healthily, stay hydrated and drink in moderation. In case a person is worried about the increased tolerance to alcoholic drinks, the best thing to do is to contact the alcoholism rehab clinic. The medical representatives of such facilities have the experience and skills to identify whether a person needs liquor abuse treatment. AlcoRehab » Hangover Symptoms, Causes, And Side Effects » Hangover Symptoms, Signs, And Effects On Body » Hangover Sweats: Can One Sweat Out Alcohol?